This entry was posted on Monday, August 9th, 2010 and is filed under Cycle Karting. You can follow any responses to this entry through RSS 2.0. You can leave a response, or trackback from your own site. Is the driver supposed to be an adult or a child? Looks to me like the steering wheel will have to be removable to allow the person (adult or child) to get in or out, and even then it looks tough, I think, for example, if the driver tries to stand up, he’ll have to pull his feet towards his body, and in doing that, his knees will hit the underside of the hood. Even with the steering wheel removed, he’d require help to get in or out, I think. I trust Virgil has considered his proportions, however you may have a point Steve. I thought I had my proportions figured out and then built a practice Cycle Kart out of cardboard and realized I need to increase the interior space significantly to accommodate my 6’5″ frame. That said, even with the cardboard prototype, I still have a very tight squeeze to fit in my plywood box. Looks great. I do love a good schematic! The driver shown is 6 Ft. and the steering wheel is 12″ O.D. and removable. Minimum 1″ foam pads to be used for seating. Plenty of ingress and egress. Knees very close to cowl bulkhead, but uses glued on interior periphery rubber extrusion. I have climbed in and out of many race cars that were tighter. Nathaniel, how’s your project coming along? 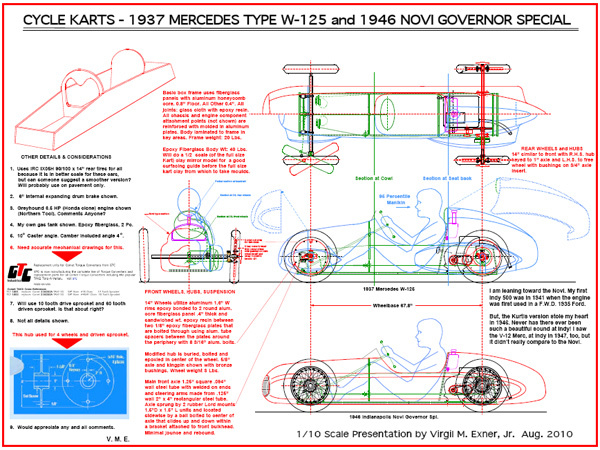 Virgil, perhaps you could comment on Nathaniel’s three-wheeler commuter build at http://www.projectstreetliner.com/. Power to only 1 wheel (Comet TAV-30 – Comet is out of business but other manufacturers are anticipated). Breaks on only the powered wheel. There isn’t a preponderance of these vehicles about. So the long term fun would seem to be based on attending rallies and get-togethers with a legal vehicle. Even the AMCK varies on some points on some builds, especially concerning suspension and dimensions. I think the most important rules would be the price point ($2124.74 today) and engine size. I would rather see more people building Cycle Karts (loosely based on the rules) than no Cycle Karts being built. Where do AMCK members and their karts gather in the San Diego county area? Any names, dates and places would be appreciated. I don’t know of anything scheduled in that area. Anyone else? Have been interested in a while at building my own cart, but have been worried about the carts safety regards flipping over and not having any protection. I’d be please to hear your thoughts and advice. Like alot of people starting out and doing research is there anybody that supplys working drawings. I’m not sure I’ve seen any Cycle Karts with roll protection or working drawings of such. The lack of proper roll protection is probably because of insufficient body structure. There is a definite correlation between vehicle weight and safety features and most drivers operate under the assumption that it is a dangerous sport. Knowing the risks, I would still encourage you to go for it. Wearing a proper helmet and avoiding hilly terrain would be good ways to improve safety. Came upon cycle karts while surfing and I have become fascinated. What about building a tubular space frame (triangulated) from EMT? (electrical conduit) It’s very light, and quite inexpensive. I have used it for several projects and the biggest problem I have encountered is that it is necessary to grind the areas to be welded thoroughly to remove the zinc coating. I believe it would be possible to construct a chassis for a cycle kart that would weigh less than 20lbs and be absolutely rigid. You could also incorporate a roll bar. One other item. I have watched several of the cycle kart videos very carefully and most of the builders appear to be using the governor linkage on the engines. Is this required by the rules? I have built several go-karts, minibikes Etc. and I have ALWAYS disconnected the governor linkage and connected the carburetor throttle shaft directly to the twist grip or pedal. These engines are governed to around 3500rpm but are capable of well over 5000. Ed, thanks for visiting and commenting. I’ve considered trying the EMT route and have seen several interesting (non-cyclekart) builds using the stuff. Do give it a try and let us know how it goes! As far as the governor linkage, I think most people leave them in place, probably to preserve engine life since these cyclekarts tend to be heavier, with greater weight to power ratios than most applications for 6hp motors.